The Washington establishment came to their own conclusions about Russia and NATO—but this is what they missed. 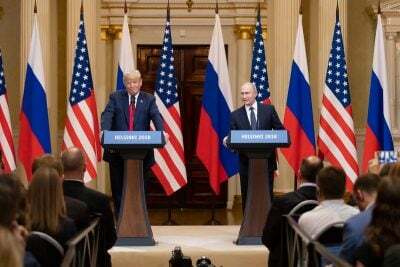 Sifting through the cacophony of commentary from the Trump-Putin meeting in Helsinki, here are four key points missed, ignored or glossed over by the Washington establishment and mainstream news coverage—and they require a good airing. 1) It’s clear now that Europeans will increase their contributions to NATO. But Big Media totally ignored the trillion dollar gorilla in room: Why does anyone have to spend so much on NATO in the first place? Are we planning a ground attack on Russia because we really think the former Soviet Empire will invade Poland or the Baltic nations? Are we planning for a land war in Europe to intervene in the Ukraine? What for is the money? The Trump administration and Big Media, for all their noise, mainly argue that more spending is good. There is no debate about the reasons why. Meanwhile Russia is cutting its military spending. Washington is so dominated by our military-industrial-congressional complex that spending money is a major intent. Remember when Washington first insisted that putting up an anti-missile system in Poland and Romania was supposed to protect Europe from an Iranian attack? Of course, it was really directed against Russia. Washington was so eager to spend the money that it didn’t even ask the Europeans to pay the cost even though it was supposedly for their defense. As of 2016 Washington had spent $800 million on the site in Romania. Now it appears that Poland and Romania will pay billions to the Raytheon Corporation for the shield to comply with their commitment to increase military spending to 2 percent of gross national product. 2) There was no focus on the real, growing threat of nuclear war, intentional or accidental. No one, including journalists at the joint press conference, spoke about the collapsing missile treaties (the only one who reportedly seemed keen to discuss it was ejected beforehand). Scott Ritter details these alarming risks here on TAC. The U.S. is now funding new cruise missiles with nukes which allow for a surprise attack on Russia with only a few minutes of warning, unlike the ICBMs which launch gives a half an hour or more. This was the reason Russia opposed the anti-missile system in Eastern Europe, because they could have little warning if cruise missiles were fired from the new bases. Americans may think that we don’t start wars, but the Russians don’t. The old shill argument that democracies don’t start wars is belied by American attacks on Serbia, Iraq, Libya, and Yemen. 3) For all the Democratic and Big Media attacks on Trump for supposedly caving in to Putin, he gave Putin nothing. His administration is still maintaining an increasingly stringent economic attack on Russian trade and banking, announcing (just days after his meeting) $200 million of new aid to Ukraine’s military and threatening Europeans with sanctions if they go ahead with a new Baltic pipeline to import Russian natural gas. Consequently, some analysts believe that Putin has given up on wanting better relations with the U.S. and instead is just trying to weaken and discredit America’s overwhelming power in the world. In a similar vein Rand Paul writes how we never think about other nations’ interests. 4) The release of intelligence agency findings about Russians’ intervention in the last election just a day before the conference precisely shows the strength of the “Deep State” in dominating American foreign policy. An article by Bruce Fein in TAC argues we should “Forget Trump: The Military-Industrial Complex is Still Running the Show With Russia,” showing how Washington wants to keep Russia as an enemy because it’s good for business. Furthermore, releasing the accusations and indictments via a press already out for Trump’s blood is explained away by pointing out that the special prosecutor has separate authority to that of the president. But the timing, a day before the Helsinki meeting, obviously shows intent to cause disarray and to prevent meaningful dialogue with Russia. It’s interesting to note that TAC has been criticizing the “Deep State” since at least 2015. The casualness with which much of Washington regards conflict and starting wars is only comparable to the thoughtlessness of Europeans when they started World War I. Like now, that war followed nearly a century of relative peace and prosperity. Both sides thought a war would be “easy” and over quickly and were engulfed in it because of minor incidents instigated by their small nation allies. It was started with a single assassination in Serbia. The situation is similar now. America is hostage to the actions of a host of tiny countries possibly starting a war. Think of our NATO obligations and promises to Taiwan and Israel. America has become inured to the risks of escalation and Congress has ceded its war powers to the president. The authority of war power was one of the most important tenets of our Constitution, designed to prevent our rulers from irresponsibly launching conflicts like the European kings. Witness now how casually Trump talks about starting a war with Iran, with no thought of possible consequences, including blowing up oil facilities in the Persian Gulf, oil and gas vital for the world economy. And so we continue careening towards more conflicts which can always lead to unintended consequences, ever closer to nuclear war. Meanwhile efforts for a dialogue with Russia are thwarted by our internal politics and dysfunction in Washington. John Basil Utley is the publisher of The American Conservative.